Mastermind toys has a great line of educational toys out called Megformers. The more I looked into these magnetic building blocks the more I was intrigued and curious. Mastermind Toys sent me the Magformers Rainbow Set 62 Pieces. I was super excited when I received the mail and opened up to find a fun and exciting new toy for the kids. The moment I showed the kids the box they were hooked, they couldn’t get into the box fast enough. Included in the set are 20 triangles, 30 squares, and 12 pentagons with an idea booklet. The colors are so vibrant and bold they just scream fun! Both my kids jumped right into playing and creating with the blocks. My 4 year old daughter was more interested in just connecting the pieces on the floor to look like a house, or a butterfly. However my 6 year old son dove right into the idea booklet. I showed him once how to follow the instructions as they show building your object flat on the floor, then slowly lifting it up the magnets magically snap together creating a rocket! Karson loves his building toys and has been entertained by the Magformers for over 3 HOURS non stop! He creates transformers that transform and turn into rockets, or cubes. He has been venturing away from the idea booklet and creating his own buildings and 3d objects. It’s so fun watching him trying to figure out how things come together to make your object 3d. McKenna is more interested in sorting the colors, stacking, and counting the blocks. The age on the box says 6+ but I would say it’s great for even the preschoolers as the Magformers are great for the fine motor skills. It didn’t take her long to discover that she could take the Magformers and use them on the fridge. Each shape encloses super strong little magnets. Karson was building a ladder here and you can see how strong these little magnets are as they are firmly connected to each other. These magnets are the strongest little magnet I’ve ever seen. Each one is enclosed inside a little capsule which allows the magnet to rotate inside so there isn’t a negative connection. However when we stack them we have encountered the negative against negative. The kids don’t get frustrated with not being able to connect their blocks together as they have with other building toys that they can’t quite figure out how to connect. These are so straight forward, there is no learning to connect, they just connect on their own. Christmas is coming up and I would very strongly recommend Magformers for under your tree, or as any gift for that hard to shop for child. Magformers are such a unique gift that any child any age would love, and even if they get duplicates, you can always use more! Head over to www.mastermindtoys.com and check out the great selection of Magformers. 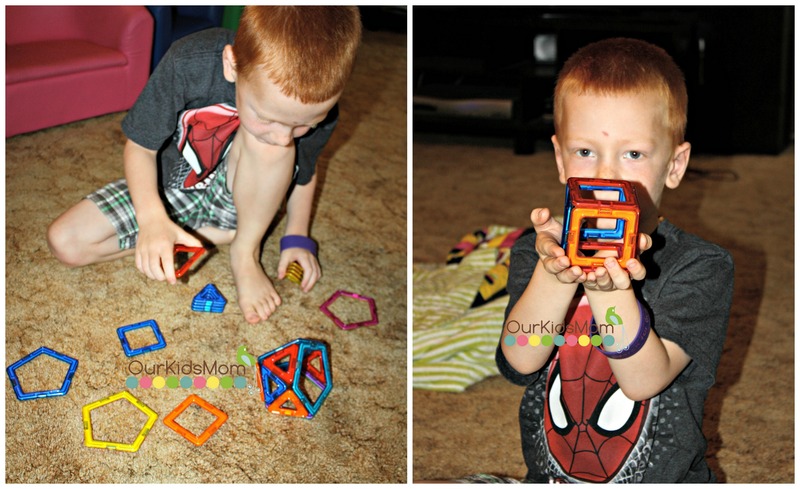 ONE OurKidsMom reader is going to win 62 pc Magformers set! This giveaway ended at 11:59 PM EST on September 30, 2014. My grandson would like the Decorate Your Own Rocket. Mastermind Toys is located in Canada and has been around for 30 years. I like the Elenco Electronic Snap Circuits with 100 Experiments. I also really like the Magformers Carnival Set! My son would love the space center!! My son would like the Decorate Your Own Rocket. My son would like the Aqua Dragons Food and Egg Accessory Kit! I learned these are called Magformers! I’ve seen them before but didn’t now what they were or where to find them. Like the Ogo Mezo ball set! I like the Magformers RC Cruiser 52 Piece Set. The Magformers Inspire 30 piece set has such pretty colors! I love the Dancing Waters speakers. I would like the Magformers Carnival Set for my nephew. I really like the Ogo Mezo ball set! I love how bright the magnets are and spark creativity in kids of however they want to use them. I also like the Hape Creative Peg Puzzle. I love educational toys that are also fun. My son has a small set and loves them! The Hexbug Robots are really cool too. My son has been seeing these and wants some for Christmas this year. I would like to get the decorate your own house playhouse. I want the Elenco Snap Circuits LIGHT set for my son’s birthday. My son would like the decorate your own rocket. He loves rockets and outer space. The girl talk locker is really cute. I like the LEGO City Advent Calendar. I also like the Magformers Rainbow 30 Piece Set. I also like the Schoenhut® 5 Piece Drum Set. I also like the Cloud B Twilight Blue Turtle. I also like Quercetti Migoga 80 Piece Marble Run. I like the LEGO Friends Advent Calendar. I’d love to get the SmarTrike All-in-1 Trike for my daughter! 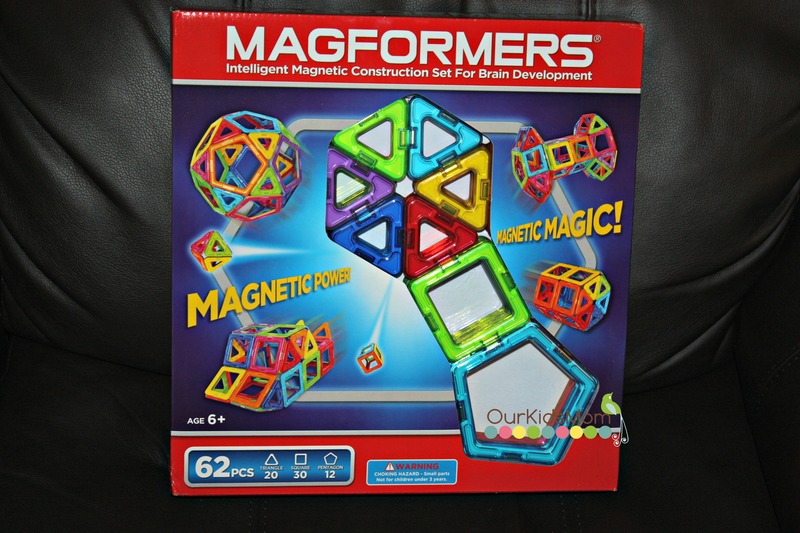 Blown away with the Magformers 258 Piece Miracle Brain Set and all of the possibilities! So many wonderful toys and items for the kids on the website. Thanks for the fun. My daughter would also like the AquaPlay 528 Megabridge Set! I like the hexbug robots. The Digibirds are really cool – can see that being a hit at Christmas this year! I love the lego mixels scorpi! I think my son would really enjoy playing with the Kapla blocks. i think my kids would like the Decorate Your Own House kit. I like that they can make create simple and complex 3-D models. The will be great for my younger son and older daughter! I learned they include “20 triangles, 30 squares, and 12 pentagons. Pieces measure 3/4″ L x 1/4″ D” and come in assorted colors. I love the ScienceWiz Cool Circuits Brain Game. My sons would love to use this and make circuit creations! I would like to get my child the Magformers XL Cruisers Emergency 33 Piece Set. My youngest son loves to build with anything and everything, I think these would be perfect him. This is something my kids would to play with. I like the Hex a bugs and Leap frog products. I like this awesome set in their collection: Magformers 258 Piece Miracle Brain Set that sells for $499.99. I love the dancing water speakers. They look so cool, and I bet kids would love them. I think my son would have a blast with the LiteHawk High Roller! Yum! ENDS 9/30 – SHOULD NOT BE OVER YET. Thanks for the heads up, the Rafflecopter has been corrected. Another item from their site that my girls would love would be the Elenco Snap Circuits LIGHT. They have a lot of interesting educational toys. Thank you for the wonderful giveaway! I would like the ScienceWiz Cool Circuits Brain Game for my granddaughter. I like the Wrebbit La Tour Eiffel 3D Puzzle. I would like to get the KidKraft Uptown Natural Kitchen. I learned “Explore and experiment with these three geometric shapes, the pentagon, square and triangle to create simple and complex 3-D models. 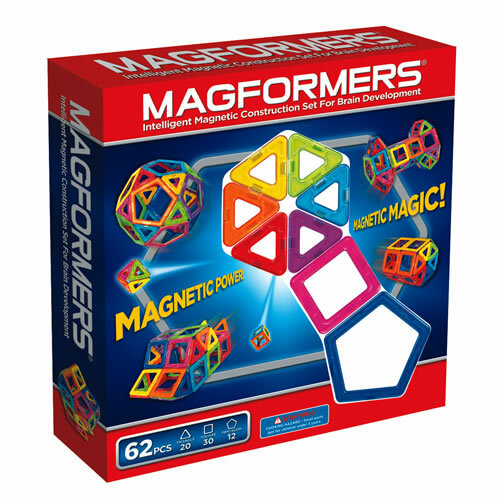 Feel the magnetic force and have countless hours of fun exploring the Magformer connection possibilities. I love that they are magnetic and that you can make anything you want with them! I love the AquaPlay Mega 544 Set with Lock Box. I like the light up set, its super fun. I like the Decorate Your Own Rocket. I like that it contains 3 different shapes! My daughter would love the girl talk locker. I like the Hape Discovery Space Center. I want the Magformers Rainbow Set 62 Pieces. Thanks for the giveaway! I’d also love the Carnival set!! fun! I also like the Magformers XL Cruisers Emergency 33 Piece Set. All of these sets look like they would be really fun for my kids. I would really love the Miracle Brain set! That is huge!! My kids would like the Magformers Lighted Set. I think my son would love the carnival set. I like the pink turtle Cloud bLight! I like that there are so many combinations in each set and that it helps with brain development! I learned that the company is in Canada and they have been in business for 30 years. I would love to have the Hape Creative Peg Puzzle. 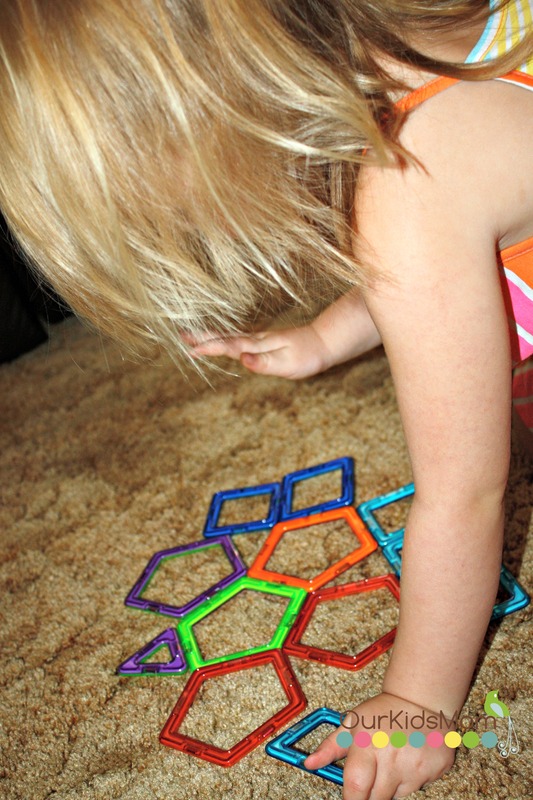 I also like the Hape Geometric Sorter. I’d love to get my son the Learning Resources Primary Science Magnet Set! I like the Magformers 61 Piece Magnets in Motion Set. The Magformers Rainbow 30 Piece Set looks great too! I think my son would like to have the 3-D Bamboo Pyramid Puzzle from the site. We would love the Magformers 62 piece set…all of us would play with it. Thanks for the giveaway! We actually really want the Magformers! Keeping fingers crossed. I think my daughter sould love the Magformers Rainbow 30 Piece Set. I would like to have the K’NEX Typhoon Frenzy Roller Coaster for my nephew. I’d like the Learning Resources Primary Science Magnet Set. The company has been around for 30 years. My boys would love the decorate your own rocket! I learned that the company was started in 1984. My daughter would love these! Magnets fascinate her and she enjoys building things. She would probably use the idea booklet as well as think up her own creations. I’m sure our frig would be covered with her diverse designs.